​​​​​​​​ SOUTH AUSTIN – According to the U.S. Census Bureau​, the Austin-Round Rock Metropolitan Area is home to the second-fastest growing population of adults age 65 and older in the country. 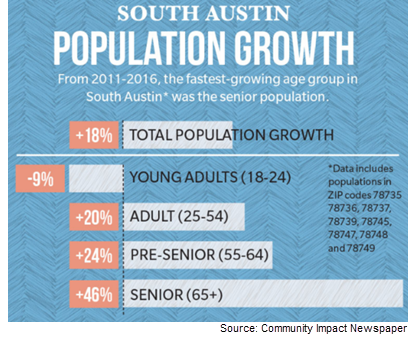 Especially seen in South Austin, the growth rate of seniors has outpaced the total population growth rate. The overall population in the area grew 18 percent while the senior population grew by 46 percent between 2011 and 2016. “Austin has a reputation of being young and hip, but Austin is aging, and city government and businesses should be more cognizant of that,” said Jannee Briesemeister, chair of the City Council-appointed Commission on Seniors. Teresa Sansone Ferguson, executive director of senior support non-profit AustinUP, said although seniors want to age in place, many Austin neighborhoods offer few options for those who wish to downsize and remain close by. She emphasized the importance creating more affordable housing options for seniors who want to age in place. In November 2017, the city outlined a commitment to serving its aging population.